: a screen or web page designed to be shown on a tv/display mounted in a call center. It provides real time stats that are easily view-able. My company has never had a real wallboard – we’ve shown the built in UCCX real time statistics page on a projector in the past, but it’s always been a low rent affair. So, as part of a new new system install, I was asked to integrate with the site’s wallboard. It turns out that their wallboard was just a plasma TV displaying some queue and agent stats. I think we can do this. 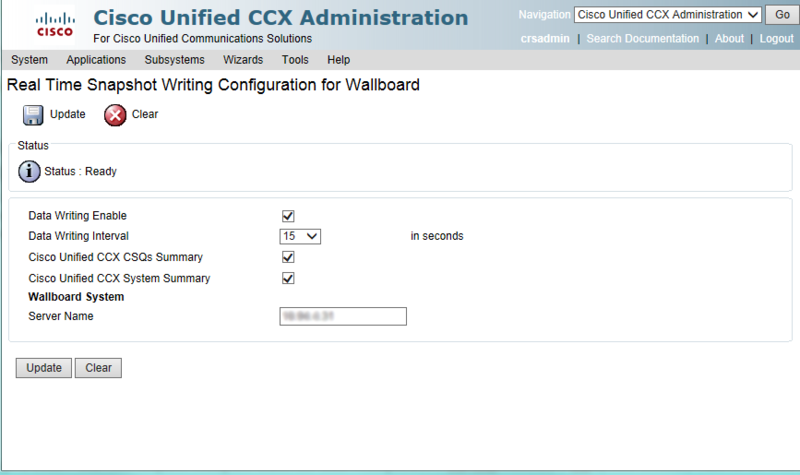 So, I began researching free wallboards that would work with my Unified Cisco Contact Center Express (UCCX) call center. 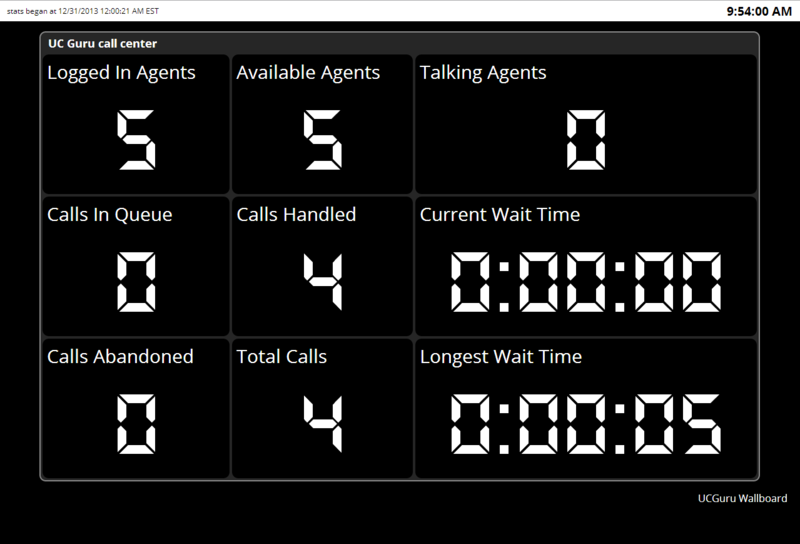 There are a number available, including a nice one from Tenox, as well as the Free of charge Wallboard 2.4. 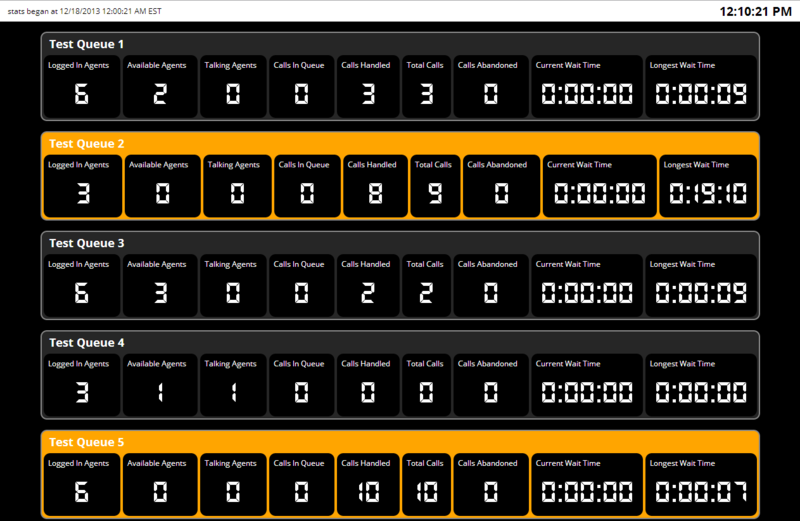 I liked the Free of charge Wallboard, but it was broken for UCCX 8, and had a pretty dated look, so I decided to update this wallboard, making it compatible with UCCX 8 and up, as well as giving it a significant face-lift. the main CSQ pages shows each CSQ with quite a bit of detail. All configuration data is stored in a single commented file – it’s easy to see what need to be changed. Updated style – most styling (the look and size of elements) is stored in a css stylesheet. red – calls are holding in the queue for an agent to become available. 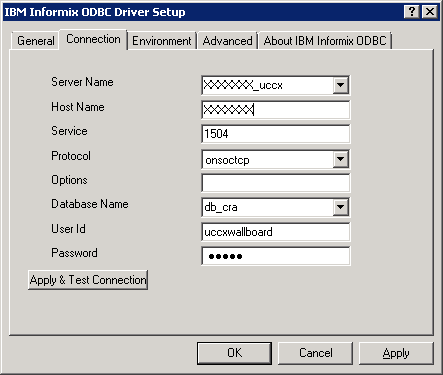 The overall idea is that you will have a windows server that will connect via an odbc connection to your UCCX server. To view the wallboard, a client pc or wallboard machine will simply view the windows server default website. Create a windows server (I used a virtual machine). 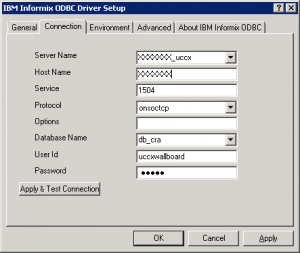 I found it easier to use the 32 bit version of windows, since UCCX will only use the 32 bit Informix drivers. Install IIS on the Windows server, and include ASP. Once installed, go to the IP of your Windows server and make sure that you see the default IIS website. 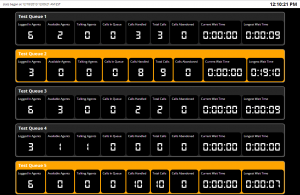 Download and and extract the UCGuru.com Wallboard (link at the bottom of this article). Put these files in the default directory of your IIS install (usually C:\inetpub\wwwroot). 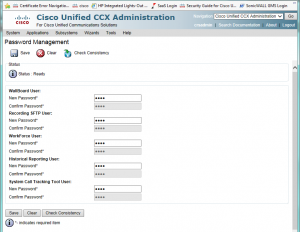 On your UCCX server, you’ll need to know the uccxwallboard user password. I had no idea, so needed to reset this. Just go to Tools -> Password Mangement and change the password for the Wallboard User. Do not use Special Characters like &!”$£, as it won’t work. 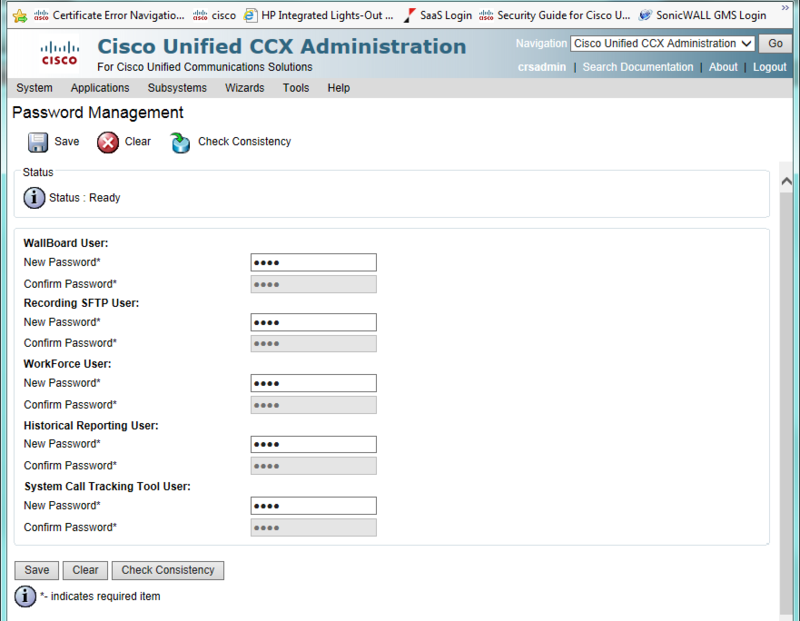 You’ll need to do this (and make the passwords match) on both servers if you have an HA cluster. Note about wallboard users – Cisco specifically recommends not using the uccxhruser, as it can cause high CPU utilization, so to stay on their good side, we’ll use the wallboard users and forego any agent data. Also on your UCCX server, go to Tools > Real Time Snapshot Config and enable the “Data Writing Enable”, “ICD CSQs Summary”, “ICD System Summary”, and set the Data writing to whatever you like. 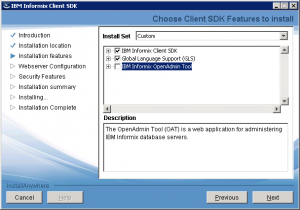 Now it’s time to configure the ODBC connection on your windows box. Host Name – enter the DNS host name of your UCCX server (make sure the Windows server can ping this box – if not then you may need to add an entry in your hosts file for the name resolution). You should now be able to go back to the connection tab and hit “apply & test connection”, and have the test succeed. Finally, we’ll need to edit the parameters.cfg file that is currently in the wwwroot folder. DBuserID and DBpass = the credentials for your wallboard user. That should get you started. You’ll notice that there is a good bit of coding in the script for agent data and stats. 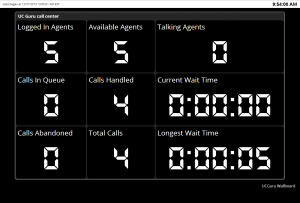 It is not possible to use this to pull agent stats using the uccxwallboard user. if you want to go against Cisco recommendations and use the uccxhruser, you can change the DisplayAgentsStatsTrue to 1, and pull information about agents. I don’t do this on my production server. Lucas added some code to show the status of individual agents without using the unsupported uccxhruser. 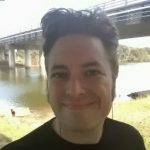 This only works if you are using the finesse desktop and uses the ‘User – Get List‘ (https://developer.cisco.com/site/finesse/docs/#userget-list) finesse API which returns the current state of the agents in a XML file. It won’t give you user stats so it’s not a replacement for using uccxhruser. Below is the code added to generate a basic table with two columns: Agent (showing the agent first and last name) and State (shows READY, NOT_READY, TALKING, etc.). I am filtering on the team name to show only a subset of agents. You will need to replace “https://nctdgao-cuccx1:8445/finesse/api/Users/”, “admin_user”, and “admin_password” with what makes sense in your environment. .open "GET", "https://nctdgao-cuccx1:8445/finesse/api/Users/", false, "admin_user", "admin_password"
For Support, please go to the UC Guru support forum. I’m disabling comments in order to provide better support. Did you get an answer or information about UCCX 11.? Just testing this for replies. Response.Write "" & TableColumnHeader_CSQStats_Column5 & " "
Response.Write "" & objRS("callsWaiting") & ""
[Microsoft][ODBC Driver Manager]Data source name not found and no default driver specified. Under IIS setting > Application Pools > DefaultAppPool > Advanced settings > Enable 32 Bit applications: Set to True. Anyone got it working on Server 2016? Running UCCX 10.5 but keep getting the ASP error. 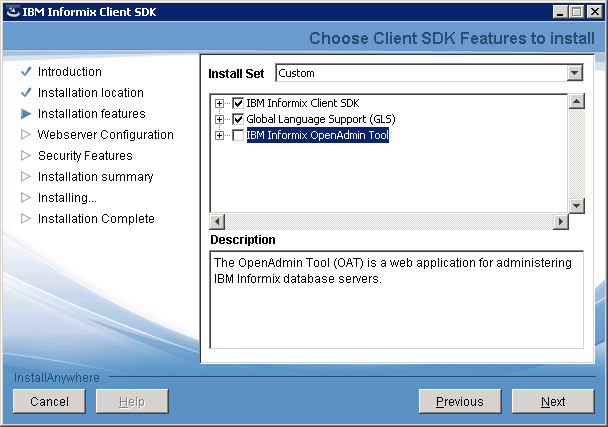 Click next until you reach Server Role, look for “Web Server (IIS)” > “Web Server” > “Application Development”, finally, select ASP and ISAPI Extensions. That’s step one, for step two, you must open the IIS Manager, look for the Application Pools and right-click the “DefaultAppPool”, select “Advanced Settings”. The second option in the new window says “Enable 32-Bit Applications”, set that to TRUE. Is there a way to display SLA? First off, thank you very much for creating such an amazing wallboard. I was wondering if anyone’s managed to get average Service Level Percentage or even service level percentage to show up for each CSQ. If not, can anyone offer hints/tips on where to get started. Fairly new to ASP.